The proven, effective, safe and innovative therapy that helped hundreds of terminally ill patients to regain their health. Soortgelijk opzetje als de Cytotron, waar dezelfde dr Gorgun figureerde. En welke zieke heeft de kennis om zelf te kunnen oordelen? "The body is made up of many type of cells. These cells grow and divide in a controlled way tp produce more cells as they are needed to keep the body healthy. When cells become old or damaged, they die and are replaced with new cells. However sometimes tis orderly process goes wrong. The genetic material (DNA) of a cell can become damaged or changed producing mutations that affect normal cell growth and division. When this happens, cells do not die when they should and new cells form when the body does not need them. The extra cell may form a mass of tissue called a tumor." Dr. Gorgun did not agree that cancer is a disease that originates from mutations in the DNA. Rather, according to him cancer is a disease of a malfunctioning energy metabolism in the cell where excessive energy (ATP) production actually leads to premature and uncontrolled cell division. Therefore all the research efforts that are focused on the wrong target namely mutations in DNA may not lead to a successful treatment or a cure. The application is very safe. No thermal or ionizing radiation is involved. 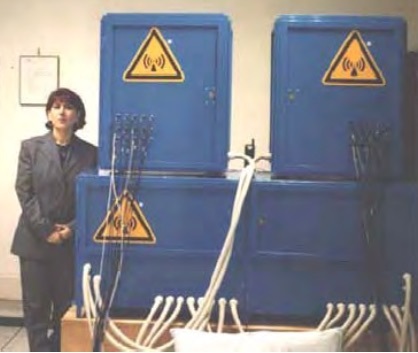 As seen in the following picture a Gamma Ray or X‐Ray used in standard Radiotherapy applications utilizes very high frequency electromagnetic waves that contains photons having energy levels of approximately 100,000 Electron Volts. GEMM Device operates at the AM frequency (kilohertz) range and a corresponding electric photon has an average of 0,00000001 electron volts. As noted earlier GEMM device utilizes the so‐ called magnetic photons with millions of times of less energy per photon corresponding to the electric photon at the same frequency. Therefore almost no energy is applied to the tumor but the radio waves are only used to regulate the processes by triggering interactions at the specific resonant frequencies. Het gaat dus om een hypothese die stevig bewijs behoeft voor je ermee behandelt. Hoewel: In 1988 was de therapie in Italie toegestaan. En wordt/werd al behandeling aangeboden terwijl met hetzelfde apparaat volgens dezelfde redenering de vooronderstelde celcommunicatie danig in de war zou kunnen worden gestuurd. Orac is the nom de blog of a humble surgeon/scientist who has an ego just big enough to delude himself that someone, somewhere might actually give a rodent's posterior about his copious verbal meanderings, but just barely small enough to admit to himself that few probably will. That surgeon is otherwise known as David Gorski.